Anyone who knows me is well aware of the fact that I love to bridge the past with the present. And few things accomplish this better than the University of Maryland, Baltimore County’s BEARINGS map, which depicts Baltimore City as it might have appeared during the year 1815. BEARINGS, of course, is an acronym: Bird’s Eye Annotated Representational Image / Navigable Gigapixel Scene. A bit of a mouthful, isn’t it? I remember hearing about this project sometime in late 2013 / early 2014, when I was working for the Baltimore City Archives. My boss mentioned it to me one morning and the two of us talked about what a neat idea it was. It reminded me of my time as an undergraduate at Washington College, working on the Chestertown 3D & Pluckemin projects in the school’s Geographic Information Systems (GIS) laboratory, making digital, 3-D models of historic buildings for placement into Google Earth. At WAC, our program of choice was Google Sketchup. Admittedly, I don’t know much about UMBC’s Image Research Center, but it sounds like the UMBC equivalent of WAC’s GIS lab, and I’d be willing to bet that Sketchup is a familiar program to the folks who created the BEARINGS map, if not the exact program that they used. Initially, BEARINGS was supposed to be a visual supplement to the Maryland Historical Society’s In Full Glory Reflected: Maryland during the War of 1812 exhibition. The first iteration of the map went live at MDHS in June of 2014. I stopped by not long afterward to give it a look. I was impressed with what I saw, and even more so when I was told that this would be an on-going project—that as improvements were made, the most current, up-to-date version of the map would be uploaded into the exhibit, effectively hitting the *refresh* button and giving museum patrons the most accurate view of 1815 Baltimore that modern scholarship could provide. It was billed as being an interactive map, and to some extent, it is. But not fully. One of its drawbacks is the fact that it’s frozen in a viewpoint looking southeast. While I can understand that it might be a bit of a data or memory hog were it fully navigable, if it’s permanently fixed and the viewer can never orient the map to look in the opposite (northwest) direction—or any other direction for that matter—what’s the point of going to the trouble to make the buildings 3-D? It defeats the purpose if the viewer can’t view every structure in 360º. Aside from the directional component, however, my initial impressions of the BEARINGS map were overwhelmingly positive. Okay, now that I’ve supplied you with my base observation, let’s perform a few experiments. Don’t worry, nothing too rigorous… We’re just going to attempt to see how well the BEARINGS project stacks up to its potential. BEARINGS is nothing short of a mammoth undertaking, so, with that in mind, how much accuracy and detail can we really expect? We’ll divide our inquiry into three separate categories: 1) buildings that were around in 1815 that still exist today, 2) buildings that were around in 1815 that no longer exist, but were photographed before they were demolished, and 3) buildings that were around in 1815, that no longer exist, and are not known to have been documented by photography—or any other method of visual documentation—before they were destroyed. This ought to provide us with a reasonable rubric for determining the success of BEARINGS thus far. We could use stars in our rating system, but I would prefer to go with something a little more Baltimore themed: like, say, the Battle Monument. An appropriate choice for the Monumental City, don’t you think? Each category will be assigned a number of Battle Monuments on a scale from one to five, and at the end, we’ll tally them for a final score. Category No. 1: I’ll start with an institution that I know quite well: Friends School of Baltimore. As an active member of the Alumni Board, I consider myself to be the ‘keeper of the flame’ when it comes to the school’s historical identity and I think that, if prompted, any member of the current administration at Friends would affirm this notion. Since it is Baltimore’s oldest school (it was founded in 1784), common sense suggests that we should be able to find it on a map of circa-1815 Baltimore. And sure enough, it’s there! Or, at least … sort of—the only extant part of the original campus. The Aisquith Street Meeting House, circa 1815. On January 29th 1784, a group of Quakers congregated in the Aisquith Street Meeting House to discuss the founding of a school. Among those present were Elisha Tyson (1749-1824)—the famous abolitionist—and George Matthews (1729-1811), the nail factory owner who had built the Aisquith Street Meeting House in 1781. To provide a bit of a context: Matthews was born the year that Baltimore Town was founded. While he lived to be a relatively old man, at the age of 82, bear in mind that Baltimore Town did not even attain its status as a ‘City’ until 1797, when Matthews was 68. So he was already pushing 70 years old when Baltimore City was brand new! 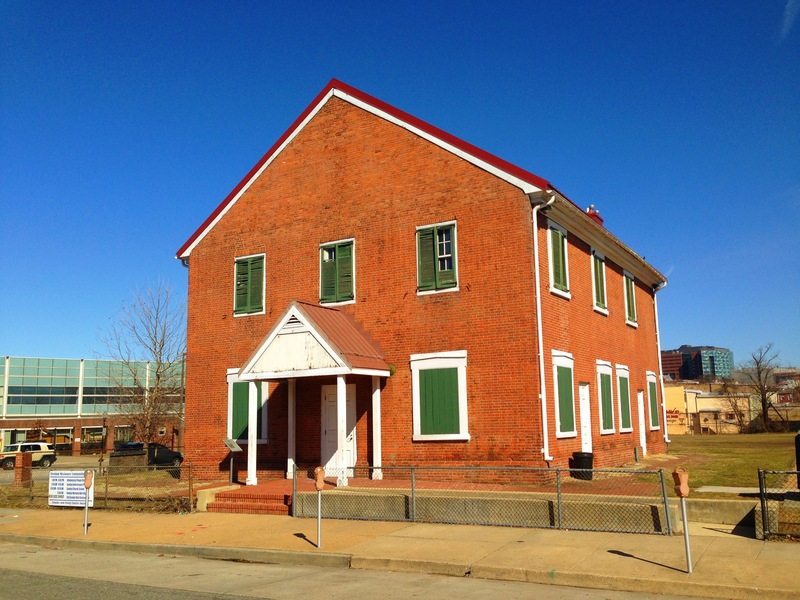 I think that he would probably be pleased to know that, as of my typing this in July of 2015, his Meeting House is still standing at the corner of Aisquith and Fayette streets—a conceptual realization to him, and a relic of the 18th century to us. 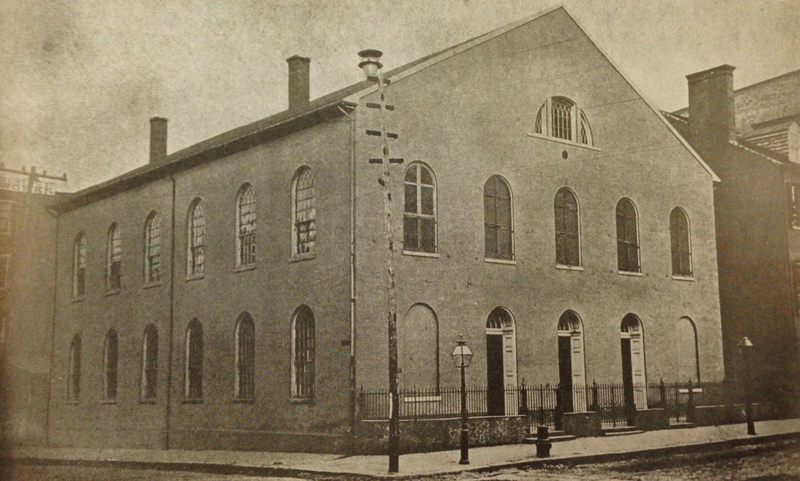 Though no longer in use as a house of worship, it is the city’s oldest religious structure, predating Old Otterbein Church (1785) by four years. The Aisquith Street Meeting House as it looks today. * or maybe not? Another blog post forthcoming! Category No. 2: This category was decidedly harder than the first. I wouldn’t even begin to know how many buildings existed in 1815 Baltimore that were photographed at some point during the 19th or 20th centuries, before they were demolished. Barring any huge disasters like the Baltimore Fires of 1873 and 1904, the fact that we even need this category is a shame! At least, that’s what we historic-preservationist types think… Granted, not every building that was standing in 1815 Baltimore was worthy of saving, but I can think of at least a dozen or so off the top of my head that deserved a longer lifespan than they got (and for each specific one that I can think of, there were probably at least five or ten more of equal cultural value). Anyway, while scouring the BEARINGS map, I came across a great example for this category—old St. Peter’s Episcopal Church, which stood on the east side of Sharp Street, roughly near the southeast corner of the present-day Baltimore Arena (or if you prefer its newest moniker, Royal Farms Arena, a.k.a. “The Chicken Box”). St. Peter’s Episcopal Church, circa 1815. Old St. Peter’s Episcopal Church, sometime during the 1800s. This is a great shot, but if the Henry Fite House was still standing when this was taken, I can’t help but think that the photographer should have turned around and pointed the camera in the opposite direction! As we can see from this 19th-century photograph of St. Peter’s, the BEARINGS group did a remarkable job of creating an accurate version of the building, based on the descriptive materials (i.e. photographs) that it had at its disposal. Well done. The truly astounding part about seeing St. Peter’s visualized on a 3-D map, however, is noticing just how close it was to the Henry Fite House, a.k.a. 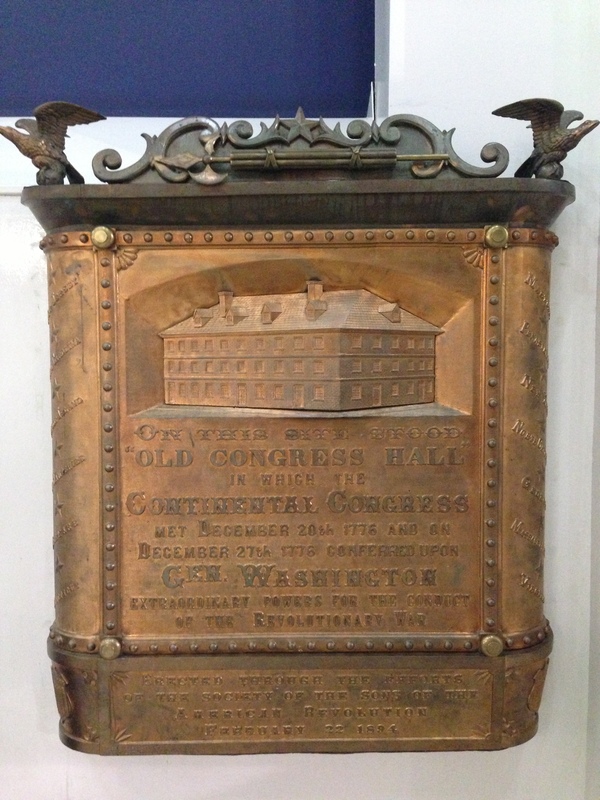 “Congress Hall,” where Continental Congress met from December 20th 1776 through February 27th 1777, when Baltimore Town was the Capital of the fledgling United States of America and the Fite House was its capitol. An all-too-unknown fact, if you ask me—and one that puts Baltimore in some rather exclusive company. While, yes, this is a start—is this really the best that we can do as a city? I know that spelling wasn’t standardized for most of recorded history. But, seriously… Can anyone spell the ‘FARNANDIS’ name correctly? When studying early 19th-century Baltimore, it is impossible to really understand both the town’s social and physical layout without consulting a city directory. In those days, city directories served as a de facto Yellow Pages or White Pages—sans telephone numbers, of course. Everyone had a city directory. Everyone needed a city directory. Since they were so ubiquitous, making them was a profitable venture! The compilers of these directories were known as ‘directors’, and being the City Director was a sought-after position among the enterprising bunch. While many of these 19th-century directories are available online for research purposes, they don’t make much sense unless you actually know what you’re looking at. In the 1814-’15 edition, we see that A) Samuel Farnandis is listed at 113 Baltimore Street, and B) his brother Walter is at 129 ditto. Great! But there’s one problem: these addresses don’t mean anything without the knowledge of what the layout of the city was like in 1814-’15, and because Baltimore has gone through at least two major street-numbering overhauls since then, sorting it all out is no easy task. The most recent overhaul took place during the autumn of 1886 (e.g. the residents who lived at 222 N. Calvert Street went to bed one night and woke up the next morning to find that their house’s address had changed to 912 N. Calvert Street), and if I recall correctly an earlier switch had taken place during the 1840s. But since we’re dealing with the beginning of the 19th century, we need something that corresponds with the very first street-numbering system. 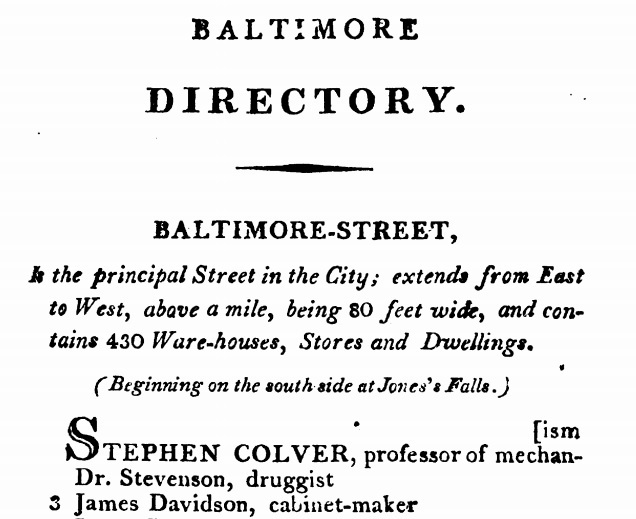 Enter James Robinson’s 1804 Baltimore City Directory. Robinson’s street descriptions are most helpful. His hard work needs to be rewarded somehow… Can we retroactively give him a Key to the City? Is there a precedent for that…? Hmm. There ought to be! Robinson’s directory is truly the ‘Rosetta Stone’ for understanding the layout of early 19th-century Baltimore. Unlike John Mullin, Cornelius William Stafford, James M‘Henry, William Fry, Charles Keenan, James Lakin, or Edward Matchett (who all organized their directories in alphabetical order), Robinson decided to organize his in geographical order, giving a name index at the front with corresponding page and line numbers, methodically tackling the city’s grid one street at a time. If he had not gone to the trouble to go “against the grain” and present his directory in this fashion, we would be at a total and complete loss for ever knowing how to interpret the other city directories that came before or after that point. And even though it’s nothing more than a list of names and addresses, Robinson’s directory actually makes for a fascinating read, as you can literally follow along as he’s walking the street, noting the inconsistencies and irregularities of a city in transition. As we can see from the order, Samuel Farnandis’s dry goods store would have been two doorways east of South Calvert-Street and Walter’s would have been one doorway west of Public-Alley. Boom! In many ways, the Baltimore City of 1804 was very much still the 18th-century Baltimore Town, with the word ‘City’ crudely scribbled over top of that second word. And 1815 Baltimore wasn’t much different, either. 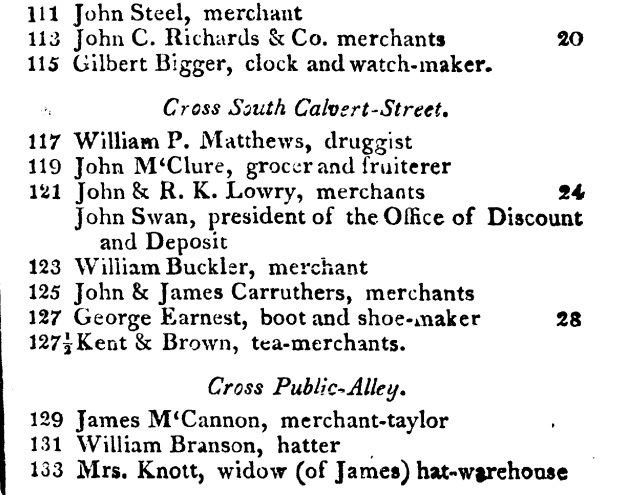 Robinson’s 1804 directory notes the rather nebulous nature of the then-current street-numbering system. The word “system” here is used very loosely. Many addresses had a ½ on the end to denote a building that had been erected between two others with already-established street numbers. And some had no street numbers at all! The word ‘next’ denotes structures that fall into this category. It’s pretty straightforward, really. This is a perfect snapshot of a rather imperfect Baltimore City as it existed in 1804, through Joseph Robinson’s eyes. In order to translate this snapshot into the present—or, in this case, 1815—modern scholars can use his street descriptions in conjunction with the fold-out Baltimore City Map that was attached inside the front cover of his directory. The Farnandis Bros. dry goods establishments on Baltimore (née Market) Street, circa 1815. A) Samuel Farnandis’s store at 113 Baltimore Street, and B) Walter Farnandis’s store at 129 ditto. Multiplied out to a 100-point scale, that gives the BEARINGS project thus far a rating of 87.5 / 100—a B+ for everyone who’s keeping score at home. That seems like a fair grade. With a little bit of tweaking, it could easily move up into the A- range—or higher! The ambition of this project is magnificent, and it is by far one of the best educational tools that I have ever seen. My hope is that it will continue to inspire other history buffs as much as it has inspired me. Even if you’re not sure whether or not you like history, or for one reason or another are confident that you don’t, I encourage you to give it a go—play around with this map for a little while. In the process of finding your bearings in 1815 Baltimore, you might just find out that this whole history thing is pretty cool after all.